While some people mod PC parts into devices that look like Apple products, Ben Heck has chosen to throw Apple IIgs parts into a laptop mod that looks more like a PC. 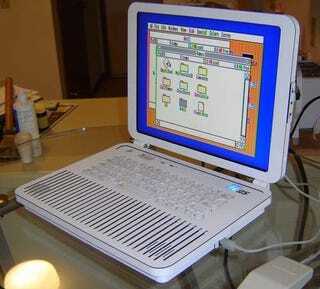 The Apple IIgs laptop has a 15-inch screen, RAM expansion, compact flash reader for storage, stereo speakers. He also included ports for a floppy disk drive, mouse and joystick. Heck even managed to incorporate the grating/vents of the original IIGS into the design. Not too shabby, however I would have liked to have seen the old beige/gray case coloring and something resembling the IIgs keyboard worked into the design for nostalgia's sake. You can check out more pics and details over at [Ben Heck].